Alloy 20, also known as 20Cb3, is an iron-based austenitic nickel alloy. It has useful corrosion resistance to oxidizing and medium reducing environments. The alloy also exhibits useful resistance to stress-cracking corrosion and pitting corrosion. Alloy 20 is an ideal piping material for alkylation process in oil refinery. This article introduces the dissimilar welding process of ASTM B729 UNS N08020 (Alloy 20) seamless pipes in SINOPEC’s alkylation facilities in Selangor, Malaysia. 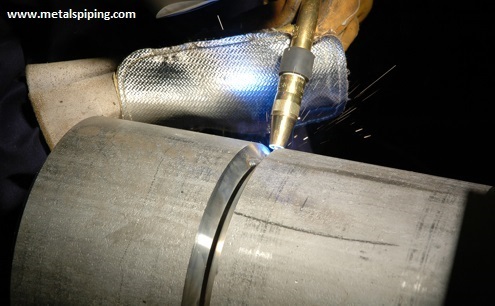 Welding an Alloy 20 seamless pipe to an SS 316 seamless pipe. High heat-susceptibility of Alloy 20 which may result in porosity during the welding. The tendency of hot cracking during the welding, as well as intergranular corrosion in welding area. Due to the high nickel content of Alloy 20 and its low flowability in molten status, incomplete fusion may occur. The formation of decarburized zone of pearlite and carburized zone of austenite may cause stress concentration. Residue stress may exist due to the different coefficient of linear thermal expansion between pearlite and austenite of the weld metal. Materials specification: ASTM B729 Alloy 20 (UNS N08020) seamless pipes, 8″ SCH40, bevel ends, length = 6 meters, annealed, 15 pieces. Its actual chemical composition and mechanical properties are listed in below two tables. *All values are based on actual product analysis. The P Number of Alloy 20 is 45 according to ASME BPVC Section IX. *The heat number of all Alloy 20 seamless pipes: G8656H. *Welding electrodes of ERNiCrMo-3 or ENiCrMo-3 are selected respectively as the filler metal for Alloy 20 dissimilar welding. *The root pass shall be welded by GTAW/ TIG method; the filler passes & cover passes shall be welded by SMAW method. *The heat input of each pass shall be < 20kJ/cm to prevent Alloy 20 from heat cracking. Interpass temperature shall be < 100°C. *The filler metals for Alloy 20 welding shall be selected in accordance with AWS A5.14(GTAW) or AWS A5.11(SMAW) respectively. *The UNS designation of AWS A5.14 ERNiCrMo-3 is N06625; the UNS designation of AWS A5.11 ENiCrMo-3 is W86112. *All tabulated values are actually measured. *All values of the mechanical properties are actually measured. Before the dissimilar welding, the bevel ends of the Alloy 20 seamless pipe and SS 316 seamless pipe shall be carefully cleaned. Generally, preheating is not required. However, when the base metal temperature is lower than 15°C, induction heating shall be conducted to avoid air condensing. During the welding, there shall be no appreciable weaving motion.